After following your easy instructions, we all ended up with our lightweight and fashionable AFDBs. 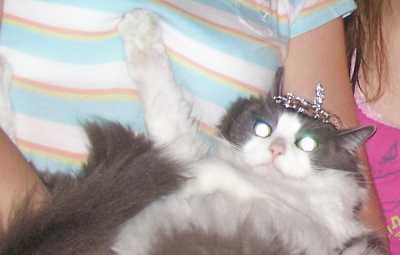 Even the cat is happy to know that we're all protected from harmful scheming government rays. We're amazed at how comfortable and easy this is to make. We all felt immediate effects of safety. On first putting on the hat, we all experienced the immediate rejuvenation of rays being repelled from our brains. Thank you so much! For years I had been the subject of a subjective mind control program to try and harness my energies for the benefit of the government. This started after capture and intergation and having what they called "Cranial screw therapy"
I found myself losing large passages of time from my memory and seemed to have a direct voice link into my skull passing messages to guide me in their pursuits. I discovered the AFDB techniques and so far I have been able to free myself from their control. Under their control I could not travel in the open without them knowing my exact whereabouts at all times. Now with my customized AFDB I can travel freely and feel I now blend in to the crowd to stay one step ahead of the goverment. I remain at large from them to this day and do not want to be recaptured to act as a disposabled puppet of their evil exploits. My only wish now is that I can discover the whereabouts of my colleauge neurolboy who fell into their hands at the same time and under their control has commited several despicable acts, he needs the AFDB to save him and mankind!!!!!!!!!!! 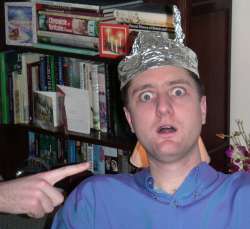 The aluminum foil hat really protects against the cancer micro wave radiation with a factor 30, which people can measure themselves. 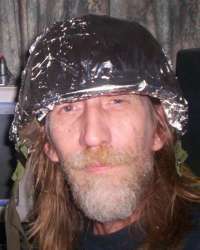 The foil has to be put on the outside of a hat so the foil does not in any way come into contact with your hat. First remove the metal knob from the cap (the antenna, ha ha) with a screwdriver. My room is now radiation free, thanks to Zapatopi. 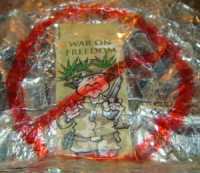 I taped a paper joint/cigarette filter to the hat showing Nazi-Bush (the skull digging sect member) holding a gun in his hand and I made a round forbidden sign out of it. You can also paint the hat. Mail me if you want to know where to get the tips. My head was pounding on the same rhythm as the cancer-micro-wave pulses, radiation meters make the pulses audible (Narda, Gigahertz). Guess what? My head stopped pounding, the temples of my forehead stopped throbbing when I protected my holy brain (seperated). On my World Peace Radio Blog, The W P R B, you can find links to studies that have shown the hat really protects with a factor 30 and people can measure the shielding factor themselves to proof it. The radiation from the cancer mobile phone antenna's is used to kill people and control the minds of the population, in Europe this is done by the N S A, Menwith Hill. I did not make up a story myself, other people claim this but some people also claim Al Gore is addicted to blood. We should not believe everything we read but test everything we learn. Everything. People discovered only 0.001 micro Watt per square meter is needed to have good reception and to be able to use the cancer mobile, which should never end up in the wrong hands, human hands. I wrote an article for wiki-pedia which was removed. 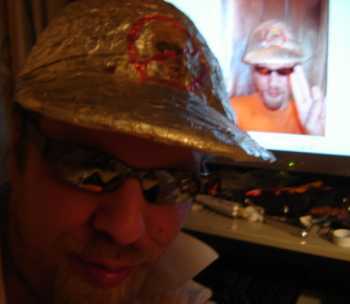 People understand now that people that wear all U caps and tinfoil hats are not paranoid schizophrenics at all and they also know the hat can not protect against Scalar Em (cheniere.org). Moving fast is the best solution (next to the A F D B) if you would ever be attacked with an energy weapon. 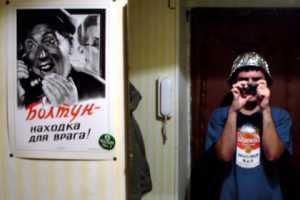 On my radio show I frequently talk about the A F D B and I have also referEd to Zapatopi dot net. Do not respond to voices in your head, they are given with the voice 2 skull method. Another technique is repeating the messages of the perps in your head. With the voicemorphing technique the supercomputer can now talk with any persons voice, even your own. It does not matter what we think, only what we do. 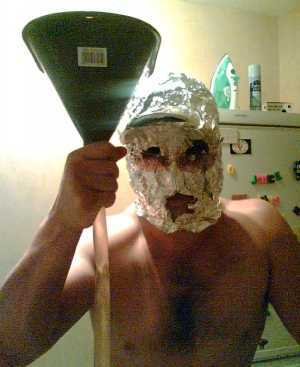 I started to wear foil after I woke up and had lost 3 weeks of my life. I had the strangest feeling that I had been violated/probed. 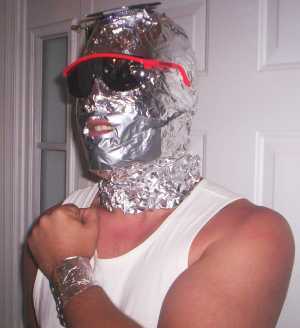 Now they cant touch me as I wear a foil undergarment. This is an attractive, lightweight AFDB. 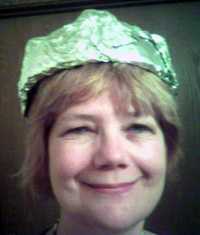 I hardly know I'm wearing it--in fact, the UPS man came to the door and I had forgotten that I had it on my head. Even though he gave me a strange glance, I felt comfortable knowing that I was undoubtedly protected against any harmful rays he could have been emitting for any sort of nefarious purpose. 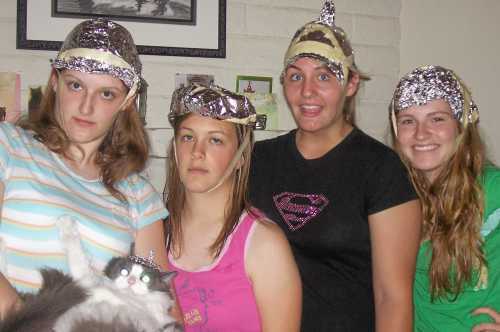 I also feel safe from alien or governmental satellite rays that are surely bombarding the atmosphere. This hat was easily constructed from the protective styrofoam cover that came with my son's "Electrostorm" Ball. How apropos!!! PS I took this picture with my phone camera, and the hat also protected me from the negative waves generated by cell-phones. I have recently discovered a way to view psychotronic mind controls rays as they are being transmitted from atmosphere from outer space. The process requires primarily only one element...pressurized unhomogenized emulsion within a crystalline structure propelled by compressed carbonate ions...or...as many know it....a can of whipped cream. By inserting the whipped cream dispenser into my mouth and inhaling only the CO2 propellant I've found a renewed sense of clarity and an expanded and broader range of viewing capabilities...one being the ability to see psychotronic waves. The other new ability is being able to communicate with Rosco, my pet bearded dragon. Thanks to Rosco's informative lectures I am now enlightened to the fact that the famous Rip Taylor is actually one of "THEM." My mission is clear -- destroy Rip Taylor and his guild of Para terrestrial minions. I shall live as a normal citizen during the day and fight the Para terrestrial forces of evil at night. As a side note I've found shielding my entire face with a wrap-around AFDB and wearing safety glasses aid in total mind protection as well as shielding me from any whipped cream splatter. Almost 7 ft tall by itself and has a retractable antenna. 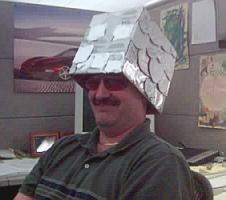 I would like to share with you a recent Aluminum Foil Deflector Beanie advancement my co-workers and I have been testing. 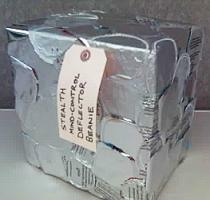 The standard AFDB's we were using in the workplace were excellent at resisting mind control, however their shape and material made our supervisor's employee locator radar "signature" greater. We have manufactured the following prototype (attached pictures) and so far it has proved useful. The sharp angles act much like those on a stealth fighter to deflect the radar locator our employer uses. Those long lunches and early Friday's have been easier in our Stealth Mind-Control Deflector Beanies. Thank you for the great website where Paranoids can share in the development of tools to combat our many enemies. Aftar a hard day drinkin' suds then spendin' all weekend a-trainin' wif tha good ol' boys of tha 'Souf Arkansor City-zen's Milishah' ('cept every forth Sterdae nite when I goes bowlin') Ah iz well aware of tha need fer such pretection frum tha insideous mind bendin' rays that tha guv'ment is beamin' inta our homes an' branes thru tha Televishun - espeshially when them thar bleedin' hart pinko commies on 'Entertainment T'night' is on! We are a small group of neighbors who live in the Orlando area in very close proximity to Disney World. We have recently discovered that paraterrestrials have been infiltrating the Disney Company for years. They have been scanning our minds then sending out their electromagnetic psychotronic mind control rays. We will not surrender to their subversion and mental enslavement without a fight! We stand united, knights in our armor of AF, an elite underground band of brothers and sisters. We are the AFDB Disney Resistance Squad! A friend of mine has donned an afdb, a photo of which i have sent. I am troubled by the ariel he has fashioned at the back- it worries me that this could actually be used as a beacon to enhance phycotronic signals! Your help would be much appreicated.